Getting him into the bathtub was easy. Keeping him there was another story. Once he was wet, Scout orchestrated a couple greased-pig-style escapes. Matt thought ahead and closed the bathroom door so he couldn’t get far. After placing him in the tub one more time, he froze as the warm water hit his small body. Scout’s legs stuck firm in cowboy pose, and his muzzle never left the tub’s ledge. His eyes gazed off to a far away place, and he didn’t seem to notice to ruckus on the other side of the door. Lex avoids eye contact after doing a cannonball off the side of a pontoon boat. 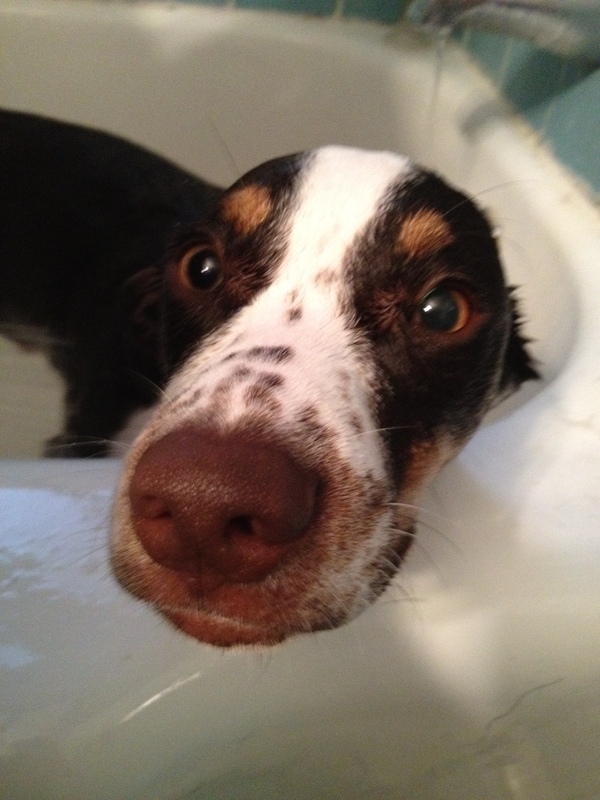 Did we mention that Lexie got her bath first? And after drying her off, we opened the door and she never looked back. We didn’t hear much of the chaos until a loud crash from the front room, followed by frenzied paw steps up and down the stairs going to our bedroom. I focused on the task at hand, giving Scout his first bath. Considering we have had him for a little more than 24 hours, the lil fella totally trusts us. After washing Scout, I handed Matt the towel to dry him off and opened the door to see what Lex was up to. I found her on the couch, cradling a hurt paw. There was blood on the couch, and somehow she had managed to clear off the entire coffee table onto the floor … including a full cup of coffee (obviously Matt’s, because I would never leave a cup of coffee to languish). It was shocking Lex had such an energy burst, especially after spending the day at our friends’ house. Josh and Holly live on a lake, and have a gentle giant of a dog, a Newfoundland named Byron. Lexie and Scout play in a lake. Actually, Lex had more bizarre behavior at the lake house. When we were loading up to go on our friends’ pontoon boat, Lexie jumped through a tiny hole above a metal door, right into the lake. Specifically, right into a pool of muck. She landed with a big splash, disappeared under the muck, then resurfaced and promptly went ashore. 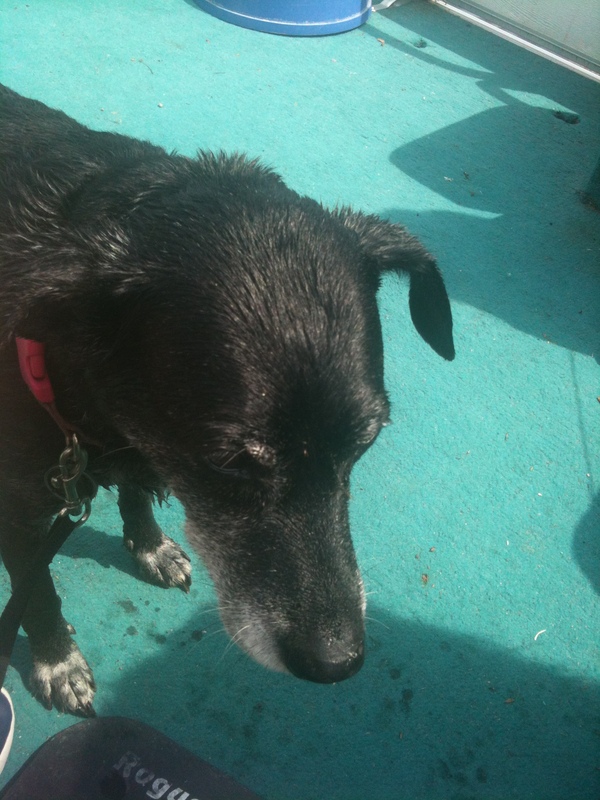 A couple hours later she dove head first into the muck again, this time from the dock as we were exiting the boat. I guess you gotta know Lex to understand this is not normal for our prim-and-proper princess. She’s all about protocol. I fear these may be symptoms of the early-onset dementia our vet recently diagnosed Lexie with. I’m not sure. But her behavior isn’t sitting well with me. For now, I’ll just think it has more to do with Scout, and the youthful energy he’s brought to our family. Could it be this puppy has put a little pep in her step? Gosh. I sure hope so. This entry was posted in Videos, Woof! and tagged bath, dog, michigan, pets, puppy, rescue, swim by ourfureverfamily. Bookmark the permalink.